Today, I’m going to review for you a hefty but incredibly beautiful book. 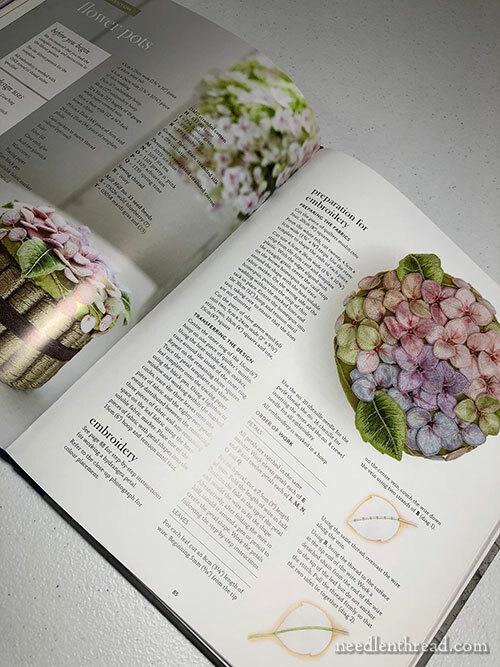 This book combines projects and instructions into an artistic, gorgeous format that makes the book a showpiece in its own right. 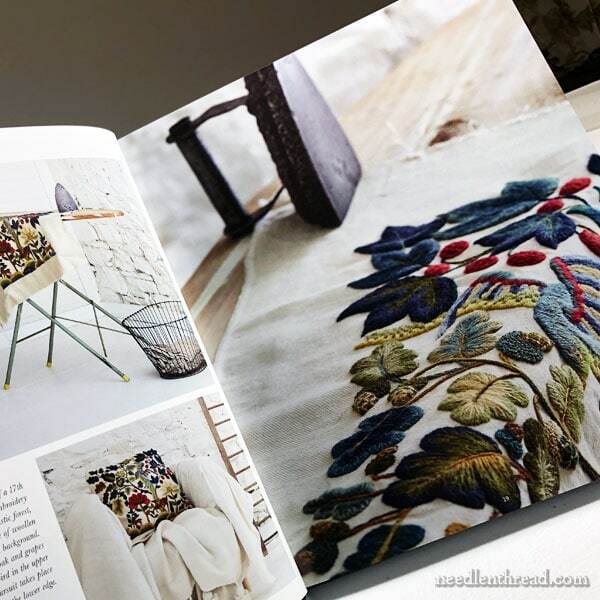 If you ever wanted needlework to make a statement to the wider world – to the world that might not appreciate needlework in itself, but that appreciates beauty in a simple yet inspirational setting – then this is the book to present. 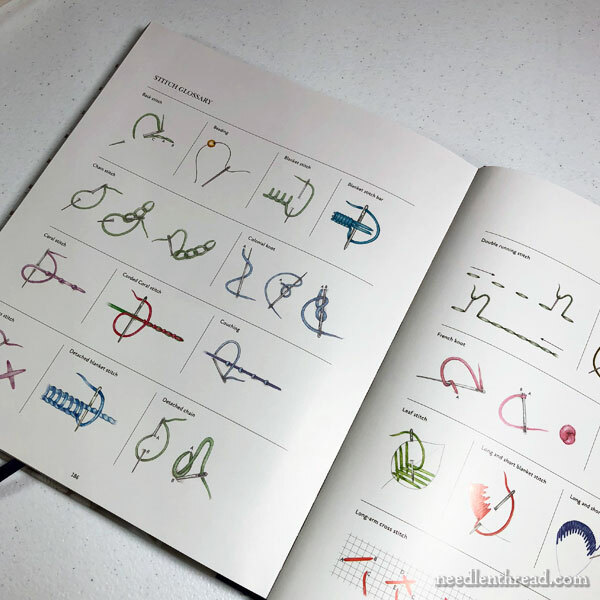 It’s definitely a creative twist on the typical embroidery project book. 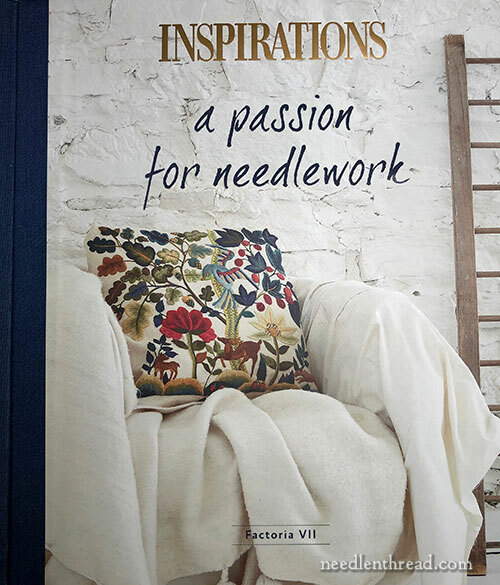 The book is A Passion for Needlework: Factoria VII, from Inspirations Studio. You might be wondering about the “Factoria VII” part of the title of this book, so I’ll get that out of the way right now. Factoria VII is a small, unique cottage hidden away in the hills of rural South Australia. It has a history to it, which you can read about in the book. The cottage, refurbished and incredibly charming and peaceful, makes an ideal setting for the twelve needlework gems featured in the book. Photography plays a major role in the whole presentation of A Passion for Needlework: Factoria VII. 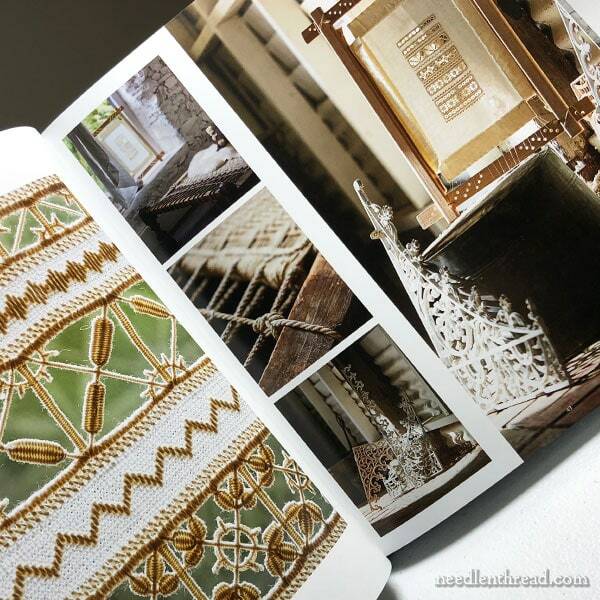 The book is eye-catching and exquisite – it’s a piece of visual art, with needlework as the focus. There’s a little bit to read in the book, but mostly, between the covers, it’s a serene escape into a different world. 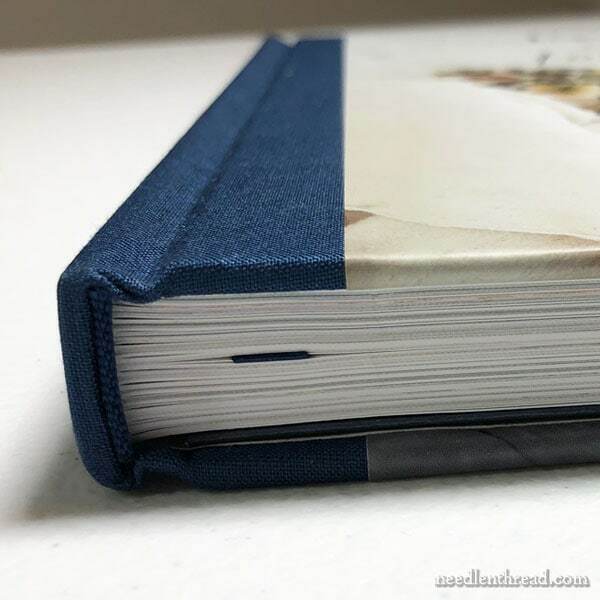 It’s a hard-bound book, with a linen-like binding on the spine. It sports a nice ribbon marker, too. And the book is large. It’s substantial. Think: Ideal Coffee Table Book. 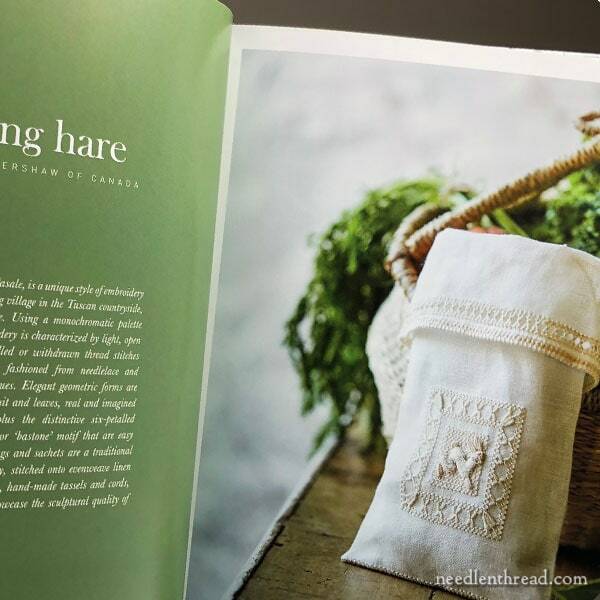 As embroiderers, though, we want to know what’s in the book! There are twelve embroidery projects presented here, with everything you need to know to recreate them. 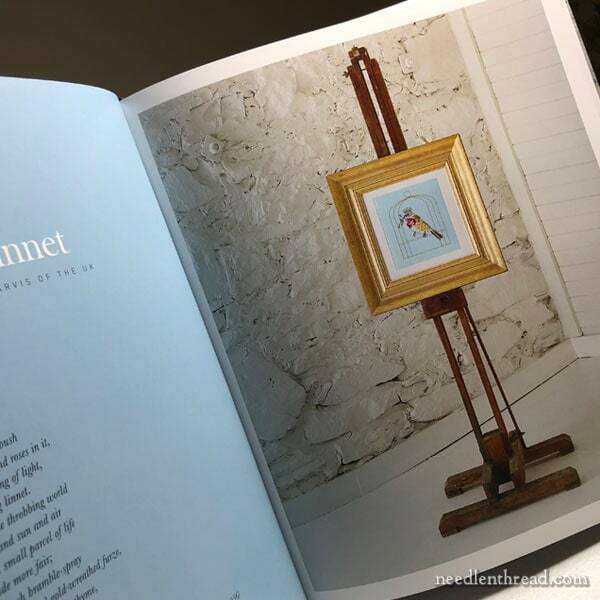 In the first part of the book, the “Gallery,” the projects are displayed throughout Factoria VII, photographed in creative ways to tie the needlework into the setting. It’s really very ingenious – and very pretty! I’m guessing the photographer must have had fun! We get nice close-ups of the needlework, too. 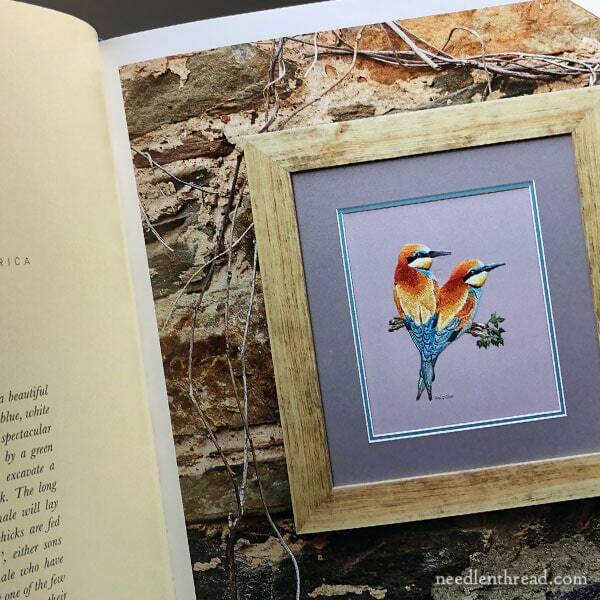 It’s not all about the beautiful setting, after all – it’s about needlework in the setting! The projects cover a whole range of needlework techniques and abilities. The Flower Pots pictured two up feature stumpwork atop lids on little “pots.” And there’s crewel embroidery (pictured directly above). 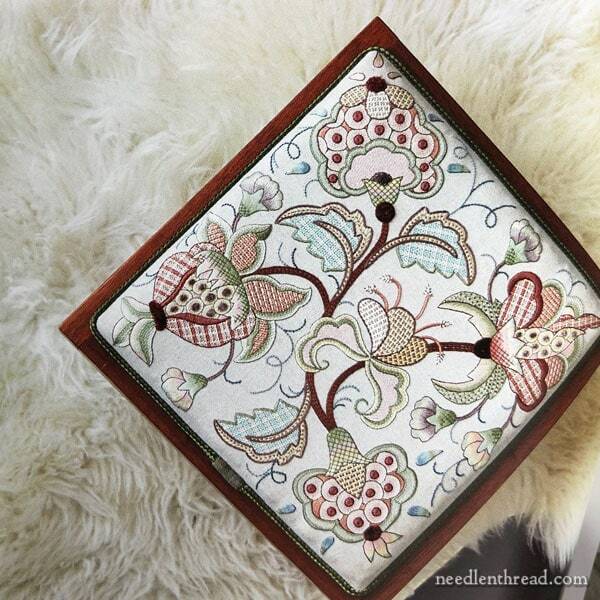 Red Currants is a free-standing dimensional embroidery project. And the chicken in the kitchen is a bonus! 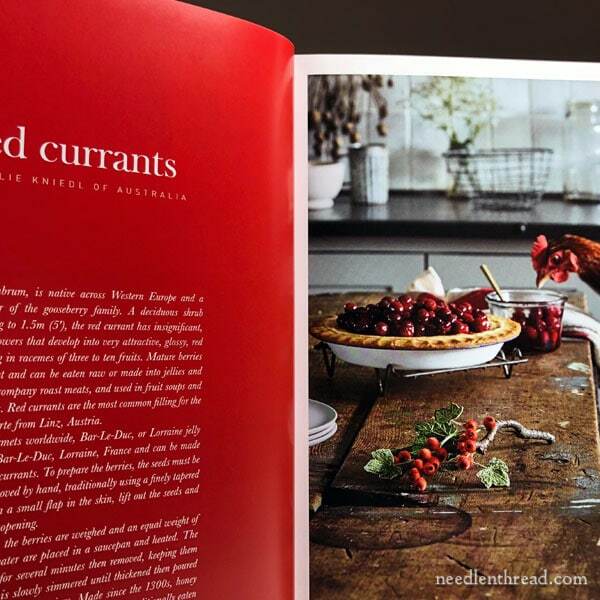 It could be the time of year, or it could just be the red factor … but I think Red Currants is my favorite project in the book! Modern and striking, this splash of color in needlepainting is breathtaking! 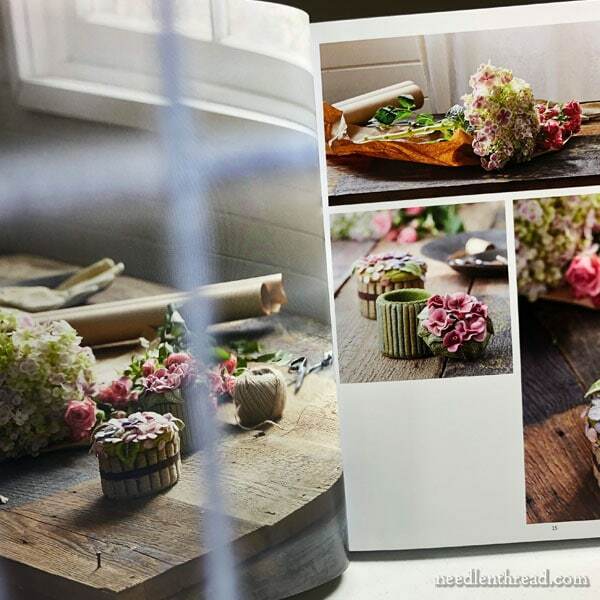 Le Magnolia is the design of Catherine Laurençon of France – her work is ever enchanting! Combining charm and function, this Versailles chatelaine set is evocative of the Louis eras of Versailles, yet it maintains a kind of cottage feel with its strips of roses and trellis fillings. You’ll find a lovely Reticella Sampler detailed in the book, for those who love needle lace. What I especially like about this sampler is that it is large enough to cover techniques in a challenging way, but small enough to be manageable. If I were picking one project from the book that I’d be most likely to do – to practice the techniques and enjoy the challenge – it would either be this project or the other whitework one detailed below. Hazel Blomkamp makes a recognizable appearance with a lovely footstool cover (it could also be a cushion cover, or a framed piece). As always, the design is exuberant and full of variety. The color choice keeps it subtle and soft. A fun project for those who like lots of stitch variety! Another small but manageable project here, in whitework and needle lace techniques. I love the finishing details on this! This is the second of the two projects I’d be most likely to do out of this book. There’s something about the crisp linen and the white-on-white that beckons me right now. Plus, it’s a manageable size in techniques that I’d find interesting, challenging, and instructive. 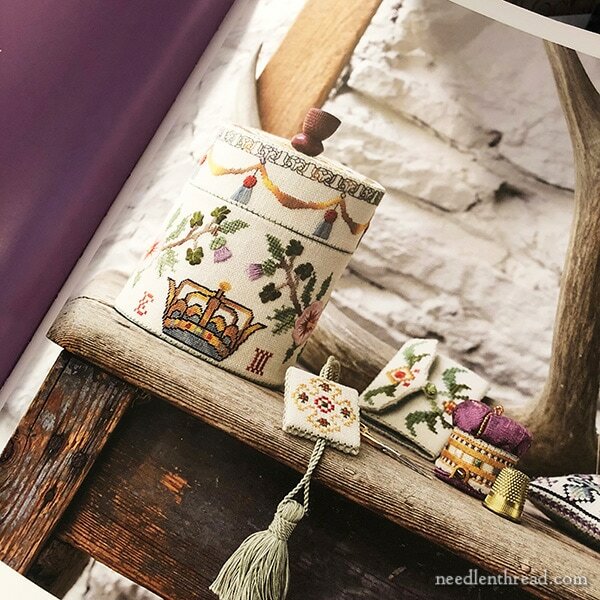 For the counted needlework enthusiast and the lover of serviceable stitching accessories, the Edinburgh Etui features a fantastic collection of finished needlework accessories that tuck into a serviceable and decorative box. Nicola Jarvis also makes a recognizable appearance in the book, with one of her floral encrusted creatures – a linnet in a gilded cage, featuring a combination of different techniques including goldwork. This exquisite piece, Blackwell Roundel, features goldwork, bead embroidery, shading and other stitches, a little appliqué – some of everything, in a small space and a tasteful design. In the book, it’s accents the front of a little “pins & needles” cabinet of sorts (it almost looks like a clock body for a very arts-and-crafts style mantel clock), with a drawer in the front and a pin cushion on top. And finally, a pair of vivid bee-eaters, in needlepainting, by Renette Kumm of South Australia! Those are the projects featured in Factoria VII – they cover a wide range of techniques and skill levels and they are just waiting for you! And of course, there are instructions! 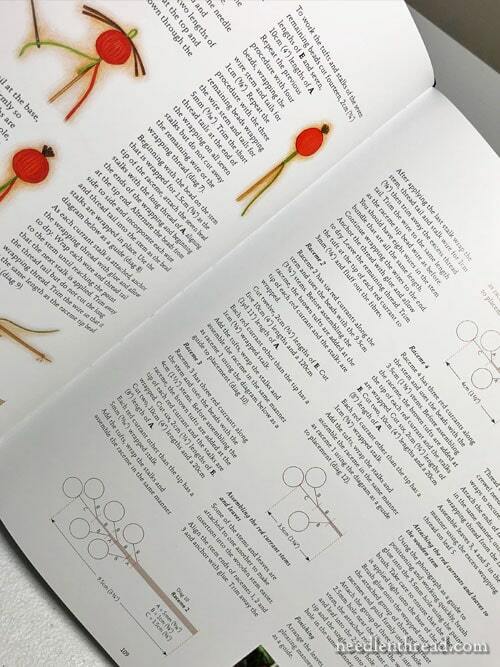 …along with step by step instructions (with diagrams and tips) for completing each project. 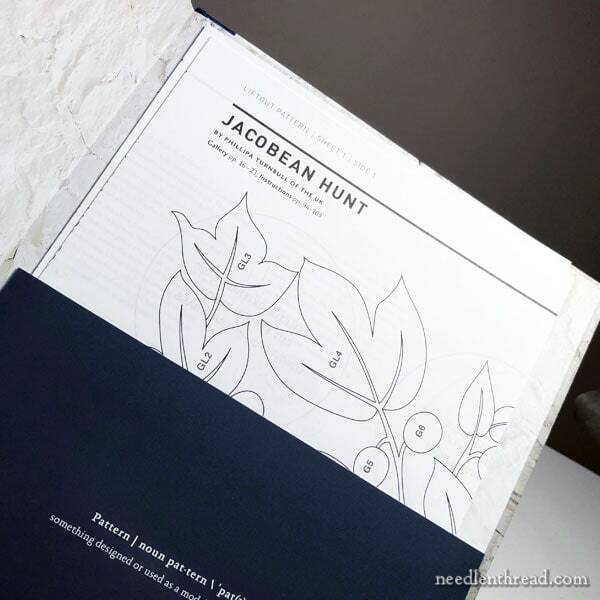 …as well as a pocket with a pull-out pattern sheet for all the projects. 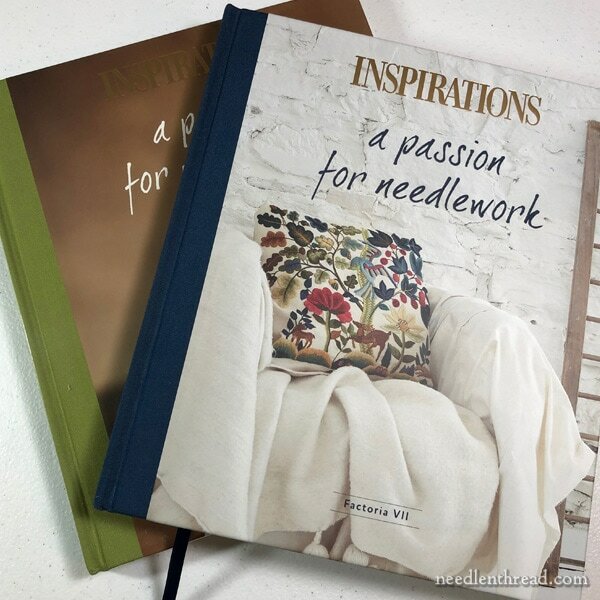 For those who want a matching set, the newest edition of A Passion for Needlework (Factoria VII) and the first volume of A Passion for Needlework are both available with hard covers with fabric spines, as shown above. The hard copy of the first volume is called the “deluxe edition,” if you’re looking for it. I previously reviewed the first volume, A Passion for Needlework here, if you want to read my review. Both books feature unique-to-them projects. Both books are beautiful. 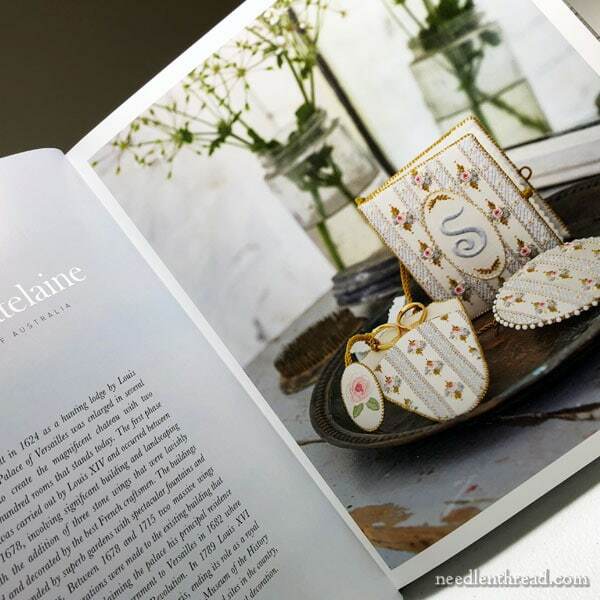 They are delightful for needleworkers and non-needleworkers alike, so they’re the kinds of books you’ll want out in your house, where friends and family can browse through them and grow in their appreciation for all things needle and thread! I don’t want to sound pushy, but if you want this book, get it now. I don’t know if there are plans to reprint it, but it has sold out through some regular suppliers already. Worldwide, with free shipping, you can find A Passion for Needlework, Factoria VII available here through the Book Depository. Here in the States, you can find A Passion for Needlework, Factoria VII through The French Needle and through Wooly Thread. In Australia, it is available through Inspirations Studios. Be aware that overseas shipping on the book will be pretty astronomical. It’s a large, heavy book! I’ll update these if I find it available through other sources. Oh, hey – and keep your eye out for my series of pre-Christmas give-aways – A Stitcher’s Christmas, 2018. I’ll be giving away five copies! 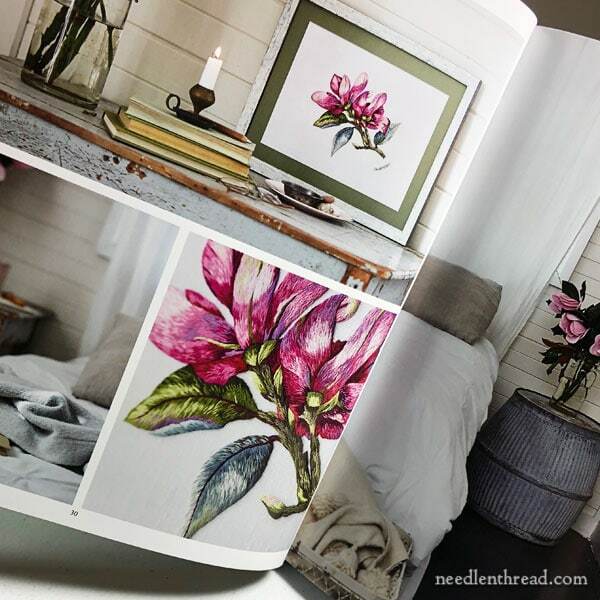 This article contains an affiliate link to Book Depository, which means that Needle ‘n Thread receives a small commission for sales placed through that link. Thanks for your support! 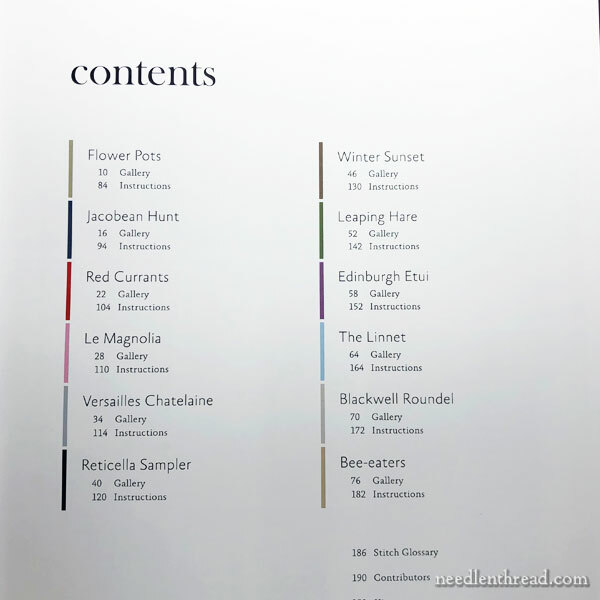 Mary – the box for the Blackwell Rondel can be custom ordered from Jennie. Her father designed it and now she has a special woodworker make them for her. The top is a pin cushion. The front has a drawer. The back has a door that opens to a large storage compartment. I had wood hooks put on the side of mine to hang threads and my scissors. As a special treat I had my monogram inlaid on the back – it matches the font in the front. Heirloom. There was even a special embroidery scissors from France you could order with it. Alas, those are all gone. Jennie’s father also designed a lovely low round box for the rondel. Oooooooh… that just sounds LOVELY. I can imagine it’s gorgeous in person. But yes, pricy! Especially coming from the UK. Jenny’s pieces are always beautiful and interesting. I hope she gets her new website set up soon! I’m glad, Joyce! You will love the books!! Mary, I have been hoping you would review this for us! I am always impressed that you are able to provide so many pictures with your reviews, as well as your helpful insights. Your efforts really help in deciding which books to acquire. Thanks! I have just received my copy of Factorial VII and I’m thoroughly enjoying reading it through. I smiled at your top choices, the two white work embroideries are my picks as well for the projects I’d like to attempt. If you decide to embroider either of these I will be very interested to follow your progress, although no pressure as I know we all have an ever expanding embroidery wish list in mind! But definitely yes, both the designs and the sumptuous photography aesthetic make for an utterly stunning and inspirational book. Exquisite! Alas, French Needle is sold out. So many projects that made me ooh and ah. These books books are sublime. Best value for money I have ever spent. I LOVE this book! Thank you for reviewing it. My partner recently went home to Sydney, so I ordered it from Inspirations and had it shipped to his Mum’s. However, I sure heard about how heavy it was when he had to carry it home. 🙂 I definitely recommend ordering it from a US retailer if you’re in the US. and a happy Monday to you. 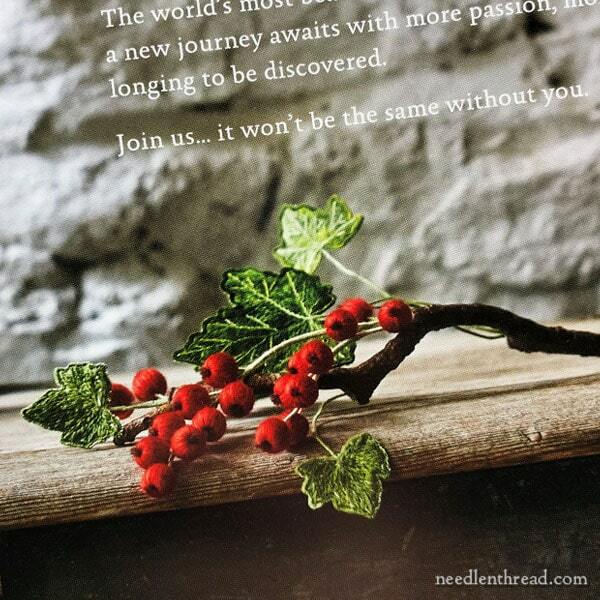 It looks like a great embroidery book one which I would love to own, but I will wait in anticipation for the pre Christmas give-aways, perhaps I might be lucky, you never know? My favourite like you is the red currents project it looks so interesting. 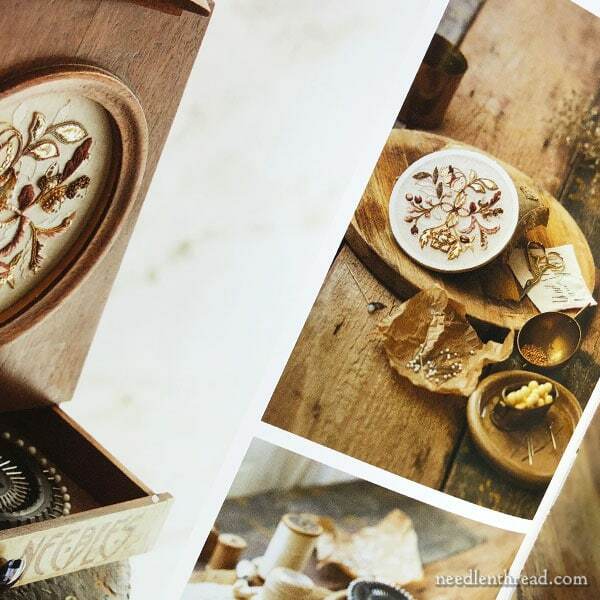 Thanks so much for sharing with us this beautiful embroidery book A Passion for Needlework, Factoria VII and for the beautiful photos. I enjoy all forms of needlework that is why I am a big fan of you. I enjoy all of your posts and some more than others. I have learned a lot. I just learned Hardanger and smocking and am happy to do these as well. Crewel embroidery is where I started doing my adult embroidery and everyone loves the pictures and pillows that I have done. I think that I should go back to it and give it a try. The Inspiration magazine that I receive have been a big help it leading me back. What a fabulous book. Many hours can be spent reading through this. This book is an inspiration to accomplish things I would not have tried other wise. areas of possibility. thank you for your wealth of information. Previous Previous post: Must-Have Little Tools for Finishing & a Sneak Peek!